For hundreds of years, black powder was the only explosive available for civilian as well as military purposes. 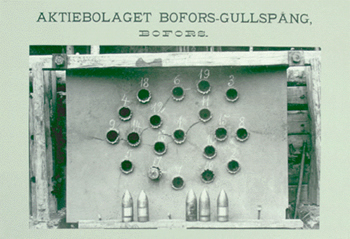 Alfred Nobel’s invention of the detonator ensured a controlled explosion of nitroglycerine and made it possible to introduce this much stronger explosive on the civilian explosives market. His second important invention, dynamite, facilitated the transport and handling of nitroglycerine. An entirely new industry grew up, based on Nobel’s patents and with Nobel as the initiator. Within ten years, 16 explosives producing factories had been founded in 14 countries with Nobel as shareholder or co-owner. Starting with a joint-stock company in Stockholm, Nobel would years after establish the first international holding company in the world, the Nobel Dynamite Trust Company. This was a new phenomenon in the business world: a company whose purpose was to own shares in other companies in several countries and control and manage their joint business. Its head office coordinated production, sales, investments and purchase of raw materials in a way similar to that of multinational enterprises of today. In 1864 Nobel founded Nitroglycerin Aktiebolaget AB in Sweden. It was a joint-stock company with a fairly small amount of capital, paid in mostly by a Stockholm merchant. For his patents Nobel received 49.6 percent of the shares in the company, besides a cash payment. 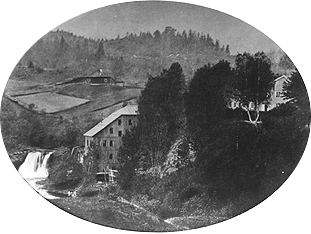 A factory was built in Vinterviken, 10 kilometers from the center of Stockholm. In early 1865 Nobel founded his second nitroglycerine company but later divested his shares and received cash for his patents. This was the only time he did so. Otherwise, he also obtained shares when turning his patents over to a new nitroglycerine company. Fully aware of the great potential markets for his new explosive, Nobel was eager to start production in other countries. In the later part of 1865, he left Sweden, never to return except for visits. He moved to Hamburg, Germany where he began manufacturing nitroglycerine, at first under provisional conditions in a shed lent to him by two Swedish merchants. After having been granted permission by the authorities he soon built a factory on a desolate site outside of Hamburg, in Krümmel. Nobel registered a private firm in his own name and later was joined by his solicitor as partner. Both partners put up capital in the firm. Nobel borrowed most of his capital by using his shares in the Swedish company as collateral and, in addition, he invested the cash he had received from the Norwegian company. He needed the capital for his German firm. Alfred Nobel owned 57 percent in the German firm. In 1866 Nobel went to the United States, the main purpose being to defend his patent rights there. After having done so successfully, he devoted himself to the formation of a nitroglycerine company. In June of that year, the United States Blasting Oil Company was incorporated. The company was given a share capital of $1,000,000, of which Nobel received 25 percent for transferring his patent rights. He also received $10,000 in cash and was to receive another $10,000 when production had reached 1,000 pounds a day. A factory, the first of its kind in the United States, was built at Little Ferry on the eastern side of the Hackensack River in New Jersey, not far from what is today the western end of the George Washington Bridge. After three years, the factory was destroyed by explosions, and the company stopped its production. These four companies were founded before Nobel had invented dynamite. The companies were based on Nobel’s patent for the method of industrially manufacturing “blasting oil” and for its safe detonation by Nobel’s invention of the detonating cap. In 1869, Nobel met Paul Barbe in France, a graduate of Ècole Polytechnique, who immediately showed great enthusiasm for dynamite. Living in Liverdun near Nancy, Barbe had witnessed Nobel demonstrate his product in the vicinity. He was willing to accept both the efforts and the financing of the introduction of dynamite in France, with its state monopoly on explosives production, on the terms stipulated by Nobel, i.e. half of the profits. A factory was eventually built at Paulilles on the Mediterranean, in Pyrénées-Orientales. When Barbe entered the scene, matters accelerated considerably. Barbe was a born entrepreneur, sometimes too pushy according to Nobel, who was himself a very cautious person when it came to economic matters, perhaps affected by the experience of his father’s two bankruptcies. Nobel’s German partner would have preferred to expand the German firm into a large exporting company. Nobel, however, had other visions. He obtained patents on dynamite in several countries and set out to find capitalists willing to back the start of production in these countries. “England is a jewel worth the rest of the world. A dynamite company there would have the entire Empire as its market,” wrote Nobel. In the spring of 1868, he went there. With a suitcase filled with dynamite, he traveled around Britain and arranged demonstrations for his new product in various places, foremost in the mining districts. He always invited the press and was satisfied with the attention that the results of his blasting shows attracted. Negotiations about starting production in Britain were carried out both in London and Glasgow. The prospects seemed most promising in Scotland where Nobel had managed to interest some industrialists and merchants. The negotiations lasted for three years which was due mostly to the fact that Nobel’s and the Scottish financiers’ terms were difficult to reconcile. Nobel wanted a larger share in the company than the Scots were willing to cede. This was solved by a compromise. In the British Dynamite Company Ltd. that was founded in 1871 with a share capital of £24,000 – even for its time a fairly small company – Nobel received three-eights of the shares for his patents and himself bought additional shares, so that he held half of the total number. In the middle of the 1870s the German, French and Swiss companies were all reorganized into limited joint-stock companies and their share capital was raised. Barbe became a shareholder in the Germany company, now renamed Dynamit AG or DAG. Nobel’s German partners, who already owned a considerable part of the shares in the Italian company, also became shareholders in the French and Swiss companies. Nobel’s and Barbe’s share in the French and Swiss companies diminished, but Nobel’s German partners lost the majority they had held in the old German firm, at the time by far the largest continental dynamite company, with profits exceeding all the other companies combined. Although highly integrated with regard to ownership, the Nobel companies did not act as a group; they did not form a multinational. Despite the fact that Nobel and Barbe held a near majority of shares in all the companies, except the French one, they did not have the decisive influence. Only in the Italian and Swiss companies, the two smallest and so far least successful, was this the case. Towards the middle of the 1880s, conditions for several of the Nobel companies were reversed. 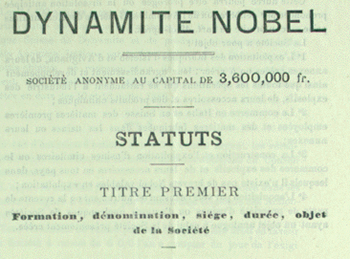 The Italian and Swiss companies, which on Barbe’s initiative merged into Dynamite Nobel in 1880, had grown quickly. Their combined profits were larger than those of the British company, which on the other hand had to face increasing competition, particularly from German manufacturers. Around 1883, the British, German, Italian-Swiss, and Spanish Nobel companies were about the same size with regard to both sales and profits. From 1883, several forms of mergers were discussed. Barbe wanted a merger of all the Nobel companies. The German manufacturers, including a group on the board of the German Nobel company, wanted a cartel consisting only of German companies for the German market. They were quite content with a price agreement with the non-German companies – and such an agreement was concluded in 1884 – since they expected to gain further ground in the British colonies. Nobel was willing to approve any form of merger, as long as the British company and its competitors were included. It was the leading men in the British dynamite company, including Nobel, who were most active in trying to get a trust company formed. It was the British company that had most to gain from a merger whereby exports would be regulated; its export market was twice the size of its home market. Nobel consistently acted as a spokesman for the British company. Ironically enough, when Nobel finally wanted to see the companies merged, he had lost the power to enforce such a project. In the beginning of the 1880s he had sold out the larger portion of his shares in the dynamite companies and placed the money in his brother’s petroleum company in Russia which at the time had great financial difficulties. In 1885, Nobel did not own above 6 percent in any company except the British one, where he held 25 percent. Nobel, as well as the British Nobel company, was forced to rely on negotiations to get the trust company formed. The negotiations lasted for more than two years. First after sizeable concessions on the part of the British company were the German companies willing to enter into agreements. In 1886, the Nobel Dynamite Trust Company was formed by the British and German Nobel companies and a number of independent German dynamite producers. In the Nobel Dynamite Trust, Nobel held 6 percent of the shares, in the Latin Trust, 2 percent. He was made an honorary president of the Nobel Dynamite Trust Co. which implied that he would not take active part in the company’s affairs. Nobel was happy, he could now retreat to his research. In 1887, Barbe managed to merge the remaining Nobel companies, the French, the Spanish and the Italian-Swiss, into la Société Centrale, also called the Latin Trust. This was more of a financial matter, since there was no competition between these companies. In 1894, Alfred Nobel acquired Bofors. His reasons were probably partly nostalgic and practical. Although he had lived most of his life outside Sweden, he wanted to return to settle there during his final years. The mansion Björkborn, which was part of the deal, offered comfortable living but he only used it during the summer in the final years of his life. As a hobby, he was planning to breed horses imported from Russia. There were, however, practical and industrial reasons too. After he had been forced to leave Paris and Sevran he moved to San Remo in Italy, where he maintained a small laboratory and a shooting range for ballistics tests. Bofors definitely offered better possibilities for experimenting with explosives and weapons technology than did the densely populated city of San Remo. The variety of forms in which dynamite production was organized in the different countries – private firms, partnership, limited joint-stock companies – reflected the contemporary transition between old and new in industrial enterprise. The financiers of the dynamite companies, a group as heterogenous as the forms of the companies, did not take any great risks. The total capital invested in all these companies did not amount to £50,000. Furthermore, the financiers had in each case a preference of six percent on capital invested before profits were distributed. In the continental companies, the capital was to be amortized in ten years. The Nobel companies varied considerably in their development and success. Throughout the 1870s, the German company, with its five factories, was the largest with regard to both production and exports, and until the middle of the decade, with regard to profits as well. After 1876, however, the company’s business stagnated, due both to a decreasing demand and to keen competition within Germany from other dynamite manufacturers. Dynamite was not protected by patents in Germany during the greater part of the 1870s. The Swiss and Italian Nobel companies were no success during the 70s; it is doubtful whether they had any actual profits at all. The French company developed only slowly. The Spanish company was a success from the start. Demand from the fast growing mining industry was great and there was little competition from other manufacturers. The Spanish company was well-managed and never caused Nobel any trouble. In relation to its potential market in the mining industry, by far the largest in Europe, the British Nobel company was a rather small company. 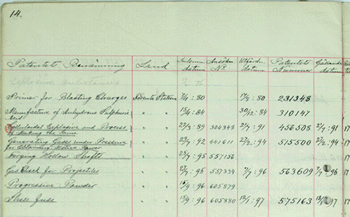 In 1877, it was reorganized into Nobel’s Explosives Co. and its share capital increased tenfold. 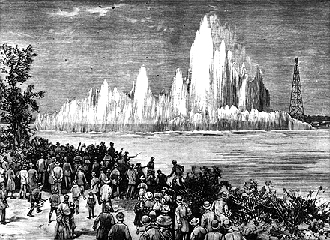 In Britain and only there was dynamite completely protected by patents during the latter half of the 1870s. The company’s profits were quite satisfactory during the duration of the dynamite patent, as was the rate of return on capital, although in no sense exceptional for the time. Competition was hard in Germany and Great Britain. Besides DAG there were now eight other dynamite producing companies in Germany. In Britain, German manufacturers and the British Nobel company fought over the market and dynamite prices fell. Competition was also spreading to the British colonies, especially to the very lucrative Australian market. As early as 1878, Barbe had suggested a meerger of all the Nobel companies. However, the time was not yet ripe. Nobel had been but mildly interested, and the then manager of the British company had been directly adverse to the idea. For several years Nobel continued to believe that his new invention, blasting gelatine, would eliminate competition. The gelatinized nitroglycerine explosive that Nobel had invented in 1875 – and patented all over the world – was certainly an improvement above dynamite, so that in that respect Nobel’s opinion proved correct in the long run. However, both the managements of several dynamite companies, not least that of the British one, as well as customers, were in the beginning hesitant. Thus, instead of producing a monopoly product, many of the Nobel companies had to face strong competition from other dynamite manufacturers. * Ragnhild Lundström is Professor Emeritus at the Institute of Economic History, Uppsala University, Sweden. She has written a thesis about Alfred Nobel’s companies entitled Alfred Nobel som Internationell Företagare (Alfred Nobel as International Industrialist), 1974.